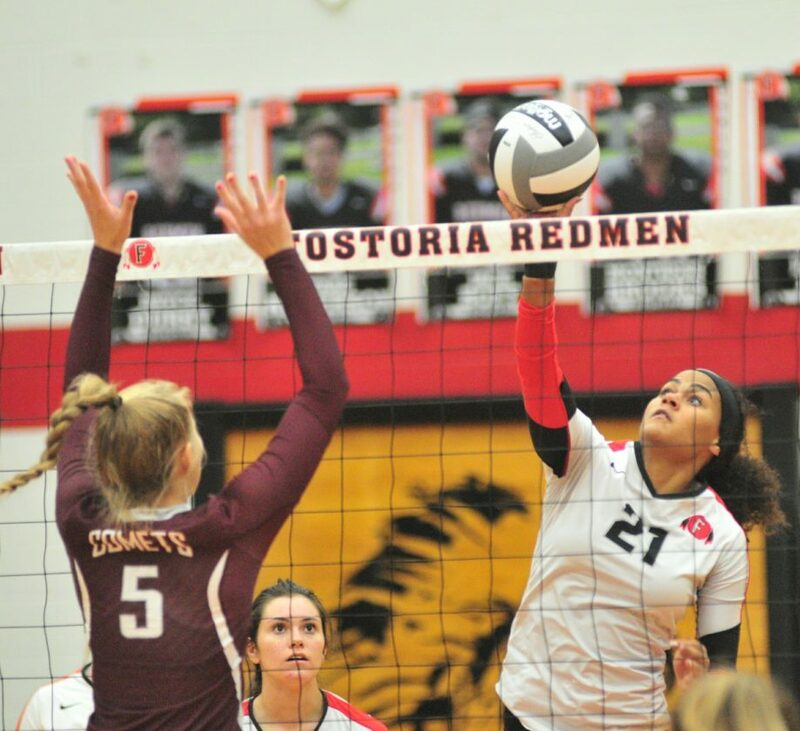 FOSTORIA — Dakota Thomas set up the offense and Fostoria followed along Tuesday, with the Redmen dropping Genoa 25-18, 25-16, 25-12 in the first round of Division III district tournament. Thomas paced the Redmen (16-7) with 40 assists and five digs. 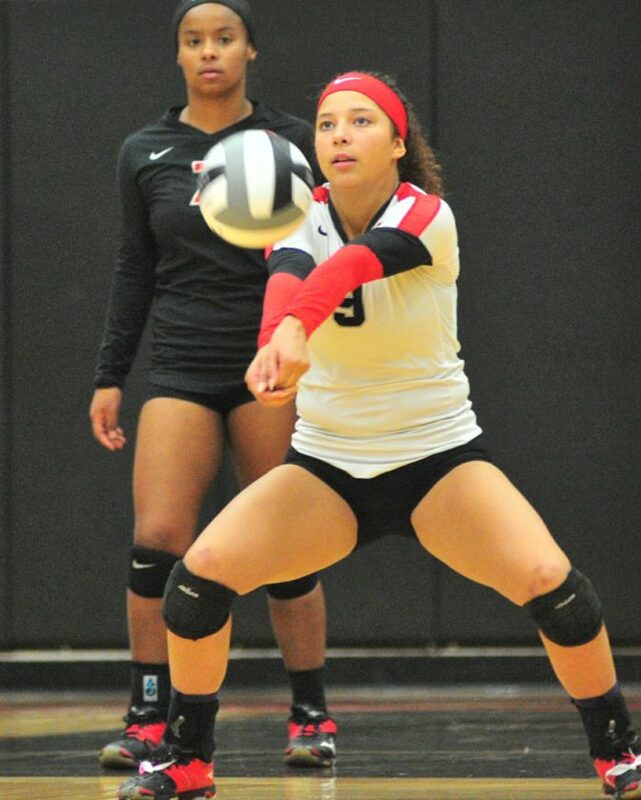 Tyriana Settles slammed 25 kills and added six digs for Fostoria, Mary Harris had 11 digs and five kills, Bailey Robinson (2 digs) slammed three kills and three aces, Meredith Grine and Alex Talley both drilled three kills, J’Breon Jones came up with 10 digs and Zoe Rice chipped in five digs. Morgan Strenk smashed 19 kills, Rachel Raimondo had 22 digs, and Heidelberg evened its Ohio Athletic Conference mark with a 25-14, 25-18, 25-18 win over Baldwin-Wallace at Seiberling Gymnasium. PHOTO BY PAT GAIETTO Back at ya Fostoria’s Baleigh Robertson makes a return as teammate J'Breonn Jones comes to assist during a Division IV district volleyball match against Genoa. The Student Princes improved to 11-10 overall. The Yellow Jackets dropped to 25-3, 3-3. Taylor Valentine, who served three aces, added 12 kills for HU. Anna McNabb dished 43 assists in the win, while also collecting 10 digs. CANTON — Tiffin University’s offense was clicking Tuesday, and there was little Malone could do. Jenna Huffman had 11 kills and two aces, Taylor Lattimore had 15 digs and the Dragons cruised to a 25-18, 25-21, 25-12 win. Sydney Gilland and Amanda Curry delivered eight kills each for TU, which improved to 11-10. The Pioneers slipped to 14-7. BELMONT, Mich. — Tiffin University’s women’s golf team must have played with a pack mentality Tuesday at the Battle in Belmont. The Dragons had five golfers compete at the event, and they were all separated by six strokes. TU shot a 645, finishing fourth. Wayne State won the event with a 634. Emily Koehler, Sarah Herb and Alice Putoud each shot a 162. PHOTO BY PAT GAIETTO Back at ya Fostoria’s Baleigh Robertson makes a return as teammate J’Breonn Jones comes to assist during a Division IV district volleyball match against Genoa.